All Points West Music and Arts Festival, a three day event featuring a variety of performers and bands, was held July 31st through August 2nd 2009 for the second year in at Liberty State Park in New Jersey. The event was hosted and promoted by Goldenvoice, who hosts another annual music and arts festival each year in Indio California. The event started out on Friday, July 31st with a performance by Jay-Z. The Beastie Boys were originally slated to perform, but were unable because the Beastie Boys’ rapper, Adam Yauch, needed surgery after a recent cancer diagnosis. In addition to several of his own songs, Jay-Z performed a version of The Beastie Boys’ “No Sleep Till Brooklyn” as a tribute to the Beastie Boys and Adam Yauch. Other Friday performers included 80’s and 90’s hip hop groups like Organized Konfusion, the Pharcyde, and Kool Keith. Attendees had to contend with rain beginning in the afternoon, which delayed the opening of the festival, dropped attendance significantly and made quite a mess at Liberty State Park throughout the weekend. Day two attendees were greeted with clear skies to start the day, but a muddy mess from Friday’s rain. My Bloody Valentine and Tool were two of the main stage performers for Saturday night. My Bloody Valentine, a band that made its name in British Indie-rock in the 80’s and 90’s, performed first; followed by the popular 90’s rock band, Tool. Tool came out with a unique sound a was a dominant band in the alternative metal movement in the 90’s; the group remains popular today and much of the night’s crowd waited impatiently for Tool’s performance to begin. Day three meant more rain, stormy weather and mud for all of those in attendance. Because of the inclement weather, the opening of the festival was delayed on Sunday and some of the musical performances had to be cancelled. Coldplay, a British alternative rock band, as well as several other bands including MGMT and The Black Keys did end up playing Sunday afternoon and evening. Coldplay was one of the last performances and their act was a great one for festival goers, despite the rainy and muddy conditions. The band performed hits like “Yellow,” and engaged the crowd by talking to audience members and inviting them to sing along. Inclement weather and the resulting muddy conditions meant that attendance at the second annual All Points West Music and Arts Festival was lower than it was in 2007, its first year. 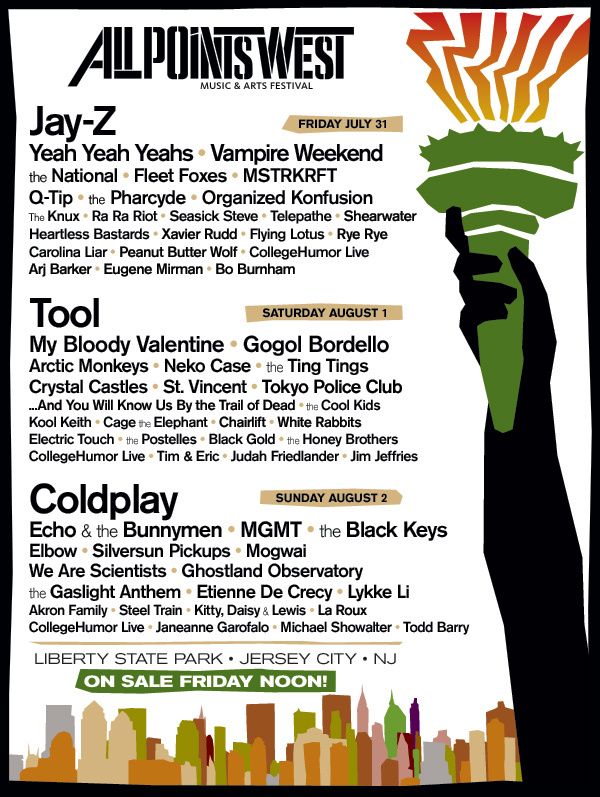 Much of the reason for the drop in ticket sales can likely be attributed to the significant amount of rain that occurred in the area the week of the festival; but it was unclear after the festival ended whether or not the festival would return to Liberty State Park in New Jersey the following year. The second annual All Points West Music and Arts Festival did not disappoint in terms of the performers featured. The weather, on the other hand, wasn’t as cooperative. Attendees who stuck around might have ended up water logged and caked in mud; but the event is likely one that will be remembered for a long time.